Position : Tips - How to completely wipe a USB flash drive? How to completely wipe a USB flash drive? Do you want to permanently wipe USB flash drive and ensure that data cannot be recovered by anybody? There are two methods here to safely clear data off USB drive and make nothing recoverable. When do you need to wipe a USB drive? How to completely wipe a USB drive? USB flash drive is a miniature high-capacity mobile storage product that uses a USB interface to connect a computer. It is portable, fast and easy to use and carry. Like hard disk, you may need to wipe a USB flash drive sometimes. Get some more space to store new data. Erasing USB drive deletes all data on the device and you can get all free space to be reused. The data is sensitive information that needs to delete permanently. Secure erase all the data on the USB flash drive before selling the device. Remove unknown virus or malware on USB flash drive. Change file system format, such as change FAT32 to NTFS, convert NTFS to exFAT or Ext4. How to completely wipe a USB drive? You cannot wipe data from the USB flash drive completely with a simple deletion or formatting, because any one can easily recover them with using any data recovery software. USB drive recovery programs can be easily downloaded from the Internet and it is quite easy to retrieve deleted or formatted data from USB drives. To completely clear an SD card, hard drive or USB flash drive needs extra operations. In this instruction, I will show you two methods that to erase data on USB flash drive permanently. Step 1 Insert the USB flash drive into your computer, wait a few second and let the computer do its job - detect the USB flash drive and install the USB driver. Step 2 Open File Explorer by double-clicking This PC and you can find the drive icon of your USB drive. Step 3 Open the USB flash drive and move the important data to computer hard drive in order to create a backup. 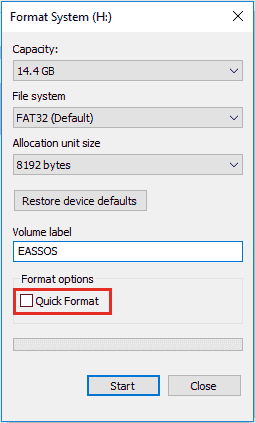 Step 4 Right-click on the USB flash drive that you want to wipe and select "Format" option from the context menu. Step 5 Select file system type from drop-down list and set Allocation unit size. If you do not know how to choose, you can follow suggested option. Step 6 Unselect "Quick Format" option and click Start button. Then Windows will start full formatting the selected drive. Note: Quick format does not erase data permanently, and you can recover lost data from formatted disk easily using data recovery software, while full formatting takes longer time to complete and wipes data complete. If this drive contains important data, you should create a backup in advance. Apart from full formatting USB drive, you can also use third-party software to wipe a USB drive. Here we recommend a free Windows partition manager – Eassos PartitionGuru to clear data for you. PartitionGuru can erase data of any partition or hard disk or USB flash drive directly and easily that the data cannot be recovered by any data recovery software. When erasing data, you can make some other settings. Step 1 Launch Eassos PartitionGuru software from your computer. Step 2 Select the USB flash drive that you want to erase data and then click on "Tools" from the main menu and click on "Erase Sectors" option. You can specify the sector range that the data need to be erased. If you select to erase data of partition, the sector number means the beginning and the ending sector of the partition. You can appoint hex characters to fill sectors. Step 3 Click "Erase". You can see the following warning message prompting the operating erases data permanently and wiped data cannot be recovered. Step 4 Click "Erase" button if you do want to erase data. Also, you can cancel it if you change your decision. Step 5 Wait for the process to complete. If you think this software satisfies your requirement, you can download this tool to erase data. Files cleared by this feature cannot be recovered, which is a good option to protect privacy.